1.Select the image to crop. 2.Go to Picture Tools > Format > Size tab. To crop one side, drag the cropping handle toward the inward side. Simultaneously to trim the same amount from both sides, press and hold the CTRL, drag the center cropping handle inward on both sides. To crop and image on all four sides, press and hold the CTRL, drag the center cropping handle inward on all the four side. 4.To set the trimming position, move the crop box (by dragging the edges of the rectangular selection box) or image. 5.Press Esc when you are finished. To extend or add a border around an image, drag the cropping handles away from the center of the image. To quickly change the shape of the image, you can crop to a specific shape. The image is then automatically cut off to complete the geometry of the chosen shape (the proportions of the image will be saved). 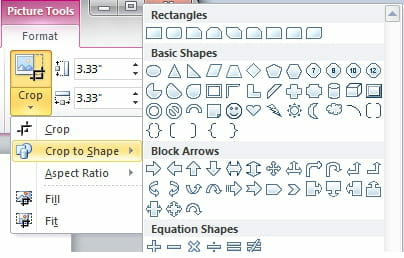 Select the image or images you want to crop to a specific shape. 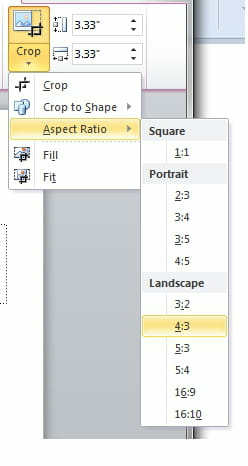 If you crop multiple images, you will need to make use of single shape or work on them individually. Go to Picture Tools > Format > Size tab. From there you can adjust the image size and choose if you want to preserve the proportions of the original image. Click on the small arrow under the Crop option > Aspect Ratio > Make your selection. The cropped portions of your images are still part of the image file (hidden). You can reduce the file size by removing these parts. Note that: This operation can not be canceled. Click on the cropped image. 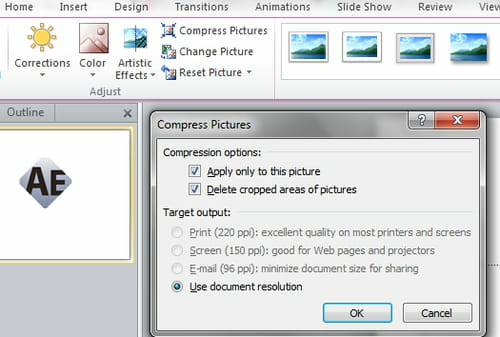 Go to Picture Tools > Format tab > Adjust > Compress Pictures. Check "Delete cropped areas of pictures". Published by deri58. Latest update on December 20, 2012 at 07:38 AM by deri58. 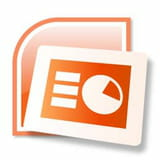 This document, titled "PowerPoint - Cropping options," is available under the Creative Commons license. Any copy, reuse, or modification of the content should be sufficiently credited to CCM (https://ccm.net/).